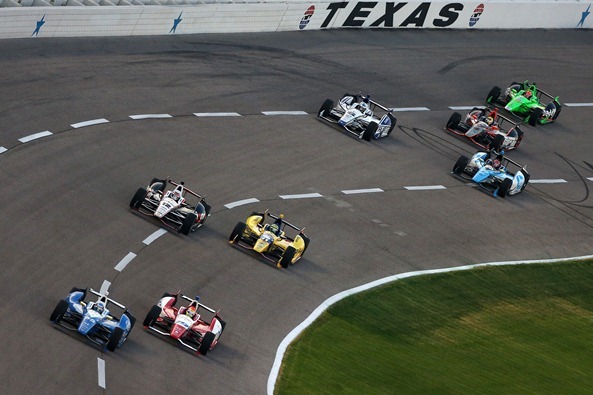 Hopefully you know by now that this weekend’s Verizon IndyCar race is a Saturday night thriller at Texas Motor Speedway. The race is set to start at 8:00pm ET on NBCSN. This will be the 26th time IndyCar has raced at Texas with 18 different winners. Helio Castroneves is the active leader at Texas with 4 wins (2004, 2006,2009,2013). He enters this race second in the championship, only 19 points out of first. If Helio were to win Saturday it would definitely boost his championship aspirations, which he has never done, but also keep the momentum going. Did you know that the winner of Texas has gone on to win the title five times? Will Power is first in the championship and returns to the place of his first oval win (2011). I would say that his win deserved an asterisk because 2011 was the year the race was split in half to create two races on the same night. Many felt his win was not deserved but I think after he won at Fontana last year, he is getting the respect he deserves on ovals. Can he solidify his lead or will he open the door for someone else to take over? Ryan Hunter Reay had a dismal weekend at the Detroit GP. Was this a hangover from all the appearances surrounding his Indy 500 win? We will know soon enough if RHR and Andretti Autosport are back on track as they all looked out to lunch in Detroit. Marco sits fifth in the championship and has looked racy this season yet again but bad luck and untimely cautions have caused him to have inconsistent finishes. Marco tends to do really well on the ovals so he must take advantage of this race to stay in the championship hunt. Simon Pagenaud has now won on two road/street courses (Belle Isle 2013, Indy GP 2014). Can the Frenchman get his first win on an oval and vault his chances to win his first IndyCar championship? Positions 7-13 are only separated by a mere 30 points. Will these drivers continue to play musical chairs or will the top 10 in points finally be solidified? Lastly, Carlos Munoz sits in sixth in points and has a firm grasp on rookie of the year. He tends to take a line on ovals that other drivers don’t and takes chances. Will it pay off this weekend for his first win in the series? For the record, I’m going with RHR. My darkhorse is Carlos Munoz. Next Next post: Mueller: Back at it again, Plans, Intro to a New Series.